What does it feel like to be deaf? This is the question Wendy Kupfer sets out to answer in Let’s Hear it for Almigal. A child with doting parents, many friends, and two “lickful” dogs, Almigal knows she is surrounded by love and good fortune. She and her best friend, Penelope, each wear a hearing aid in their favorite colors, and it’s no big deal. But what is a big deal is her inability to hear the fine details of her life: the giggle of her friend’s sibling, the declarations of love from her parents as they kiss her good night and the song of the robin. “I need to hear every single sound in the whole entire universe!” Almigal declares. That’s when she learns about cochlear impants, and on her doctor’s advice, gets a pair installed. With the implants, Almigal is able to hear the things she missed before. She can enjoy reading her favorite books out loud and hearing the soft “Swan Song” during her ballet class. Sure, there are minor complications with the implants. She tries to install them in her dog’s ears, an idea that doesn’t go down well with her parents or her dog. And she jumps into a swimming pool at a party, forgetting her doctor’s cardinal rule that the implants never get wet. But both problems are solved, and Almigal’s world becomes much more audible. 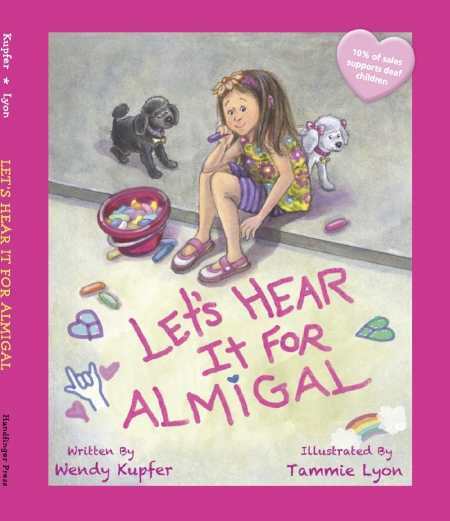 Beautifully illustrated by Tammie Lyon, Let’s Hear it for Almigal should be required reading for children who are hearing impaired. It’s easy to identify with Almigal, a child full of energy, enthusiasm, and mischief. Written in language that is simple to understand for children ages three through eight, it describes a story close to the heart of its author, whose daughter Ali was diagnosed with hearing loss when she was an infant. Kupfer refused to believe the doctors when they said Ali would never speak, and the two worked hard to beat the odds and produce “one spunky, confident chatterbox and two passionate advocates for the deaf and hard of hearing.” Their story comes to life in this book, thanks to its ring of truthfulness and to the gorgeous images of Lyon.